Vincent Cassel's sneer is on in Mesrine: Public Enemy #1. 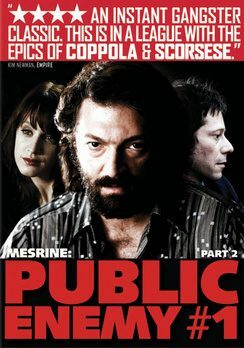 Mesrine: Public Enemy #1 is the second chapter in the two-part epic film about the life and career of Jacques Mesrine, the most famous criminal in the history of France. This installment is once again directed by Jean-Francoise Richet (Assault on Precinct 13) and stars Vincent Cassel (Black Swan). While the first movie in the saga, Mesrine: Killer Instinct (both parts were shot togther), detailed the career criminal’s early initiation into a life of wrong-doing and his growing nefarious activities, Public Enemy #1 deals with Mesrine’s later years and the self-created legend (with the help of an eager media) that whirled around him. Covered in this chapter is Mesrine’s return to France following a crime spree across Europe and North America, arrests, escapes (from prison and even a courtroom! ), the writing of his jailhouse memoir on which the film is based, his romance with girlfriend Sylvia Jeanjacquot (the always-welcome Ludivine Sagnier) and his last stand against the Paris police department (which is actually where the first part began before flashing back to Mesrine’s early days). Good-looking locales, a solid cast and a steady pace work in the film’s favor, but, ironically, Public Enemy #1 is a little more colorful than its predecessor, which covered the period from the late 1950s through the early 1970s, with all the fashion, music and stylized European living of that time. Of course, it was more fun to be a successful criminal during that era. But Cassel’s portrayal of Mesrine in Part 2 is still outstanding, with his performance hitting all the right notes as he enjoys his manipulation of the French media and grows increasingly paranoid as he hurtles toward an end that he instinctively knows is coming. So, Public Enemy #1 is worth a look-see, but only after checking out the first chapter, which has been available on DVD and Blu-ray for a month now. The film comes without any special features, which is a shame, as we would have liked to hear about the making of this two-part series from Richet and his international cast.